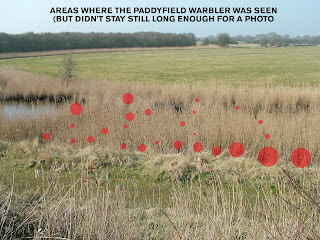 Well, I went for it and after two hours of standing around in a deceptively chilly breeze, I eventually saw the Paddyfield Warbler at Pagham Harbour on Wednesday. Actually, yes it was. But that's probably because I was successful in getting good views this skulking, tricky-to-see Warbler on and off for about half an hour. If I hadn’t seen it, it would have meant spending three hours in the car, plus another four hours standing in front of a reedbed – desperately searching for some movement in the reeds – for nothing. Inevitably, in a twitching sense, the stakes were always going to be high. There are only ever two possible outcomes to a twitch – you see the bird, you don’t see the bird. I saw the bird, and it was hard-earned. When I arrived just after midday, there had been no sighting of the Paddyfield since early morning. That was good news in a way, because I knew the sun was due to burn off the gloomy, foggy skies in the afternoon and the Paddyfield was more likely to pop its head over the reeds if the sun came out. Walking along the North Wall, I heard three Cetti’s Warblers (seeing one) as a noisy cloud of about 250 Dark-bellied Brent Geese flew overhead. I joined the few birders prepared to brave the chill wind to stare at an area between two wooden benches where the Paddyfield Warbler had been regularly seen during the past few weeks. The sun had broken through en route, but it had been reluctant to show itself on the coast, and a ‘light’ breeze (that’s how the BBC Weather site forecast described it) was giving me constant reminders that I wasn’t wearing appropriate attire to be standing around for too long. After about 45 minutes I went for an absent-minded wander while on the phone to Annie, when the three remaining birders whistled at me and were waving their arms about. The Warbler had appeared. Needless to say, by the time I had scuttled back it disappeared again. It was another hour-and-a-quarter before I noticed movement low in the reeds in front of me and the Paddyfield Warbler poked its head up enough for me to see it. It was on the move, quickly flitting along almost at water level, before climbing up higher to pose for a moment. It then disappeared before rising up and taking briefly to the air and then dropping down into the reeds again. It did this often for the next 30 minutes or so, giving a good demonstration of its feeding habits. Being such an active bird it was impossible to get a photo of it, which is always a pity, but hopefully I will pay Pagham another visit in the coming weeks just to get a record shot of it. I left at about 4pm, so my plan to travel back via Burpham for the Rough-legged Buzzard and Worthing High Street for the Yellow-browed Warbler had to be aborted. If I hadn’t seen the bird, of course, I would have travelled home disconsolate, announcing I wouldn’t bother coming back. Twitching would have been off the menu for some time. But I'd seen this rare and interesting migrant, so I left happy. Added to which I arrived back in time to see my first spring migrant on the patch - two Chiffchaffs (107) next to the path north of Mercers West. A twitch can always sting closer to home. Graham James sent me a text yesterday to tell me of a Firecrest on the local patch next to the footpath close to the Moors by the railway line. My bogey bird. The bird I’m destined never to see again. I was already on my way to Canterbury to join my mum for a hospital appointment in the morning so I didn’t get to try for this wretched thing until 5pm. Low and behold, I couldn’t find it. I keep telling myself and those who read this blog that I'm not going to go out of my way to see a Firecrest – but this one was only about 500 yards away from my front door, so I had to go for it. It doesn't matter, however, whether it's 500 yards or 500 miles. A dip hurts just the same. Still, the southerly winds are bringing the migrants in. Sand Martins and Wheatears have been seen around the county, including three Sand Martins on the patch. The pace is likely to be turned up a notch during the next week.